Leading Learning addresses the impact on education of new technologies. The explosion of digital information calls for new working spaces, new networks, and new approaches to supporting learning. Leading Learning is focused on the concept of the new school library learning commons which responds to the needs of 21st century learners. School libraries are measured by the transformative changes in knowledge and learning they encourage and support. In the document, learning commons are positioned as centres of teaching expertise which is achieved through a combination of resources, technologies, collaborative strategies, and physical and virtual learning spaces that support all learners as they evolve. 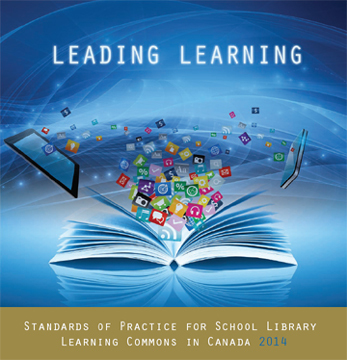 This publication offers a vision and provides practical approaches for all those engaged in creating successful 21st century school libraries in Canada. Its framework presents five standards supported by a set of themes and growth stages that lead to the transformation from traditional library facility to vibrant library learning commons. The standards represent guideposts along a journey of continuous growth. Because Canadian schools are at different points on this journey, this publication includes a range of markers of progress, sets of implementation strategies, and rich examples of innovation and success. Leading Learning also contains key resources to provide educators, individual schools, and school districts with helpful direction and support. CLA focuses on partnerships and liaisons within and beyond the school with other libraries, such as public and academic libraries, and organizations such as school board trustees, and the Council of Ministers of Education in Canada. Leading Learning has been developed jointly by CLA’s Voices for School Libraries Network and CLA’s School Libraries Advisory Committee. Leading Learning is an example of partnership in action. Its development involved regional committees and individual and small group participation from the following organizations: British Columbia Teacher-librarians’ Association (BCTLA), Alberta School Library Council (ASLC), Saskatchewan School Library Association (SSLA), Manitoba School Library Association (MSLA), Ontario School Library Association (OSLA), Québec association pour la promotion des services documentaires scolaires (APSDS), New Brunswick Department of Education, Mount Saint Vincent University (NS), Newfoundland and Labrador Teacher-Librarians, Yukon Teacher Librarians’ Sub-Association, Prince Edward Island Teacher-Librarians’ Association (PEITLA), Northwest Territories- Yellowknife Catholic School Board, and Nunavut Department of Education. This resource was republished by The SEO Brothers. We specialize in Halifax SEO, HVAC SEO and Delivering SEO Audits. If you have any questions about the Leading Learning or this resource please visit the CLA website at CLA.ca.